When my parents used to say things like "time goes by so fast" and "where does the time go? ", I used to wonder what they were talking about. Now as I LIVE and FEEL every word, my college-aged daughter has that same look upon her face as I lament over the fleeting days. In keeping with the old adage that there is no time like the present, I decided to try something new for 2011. I'd like to experiment with new techniques, explore new mediums, stretch outside my comfort zone - and I'm hoping you'll join me in this quest. How many times have you looked at some wonderful creation on a blog and wished you could make something like that? The truth is we could all make that something with a little shared knowledge. And with that thought in mind, Tutorial Tuesday is born. I envision this as an avenue for not only sharing our ideas and talents, but for creating new friendships. It's also a great venue for sharing your blog with a whole new audience! Email me with a brief, concise tutorial of ANYTHING! It could be paper, mixed media, collage, fabric, jewelry, graphics, a recipe - anything! Remember, what may seem very simple and basic to you, is brand new and unknown to someone else. Include photos of the work in progress and finished project. I can post the tutorial, still with a link to you. 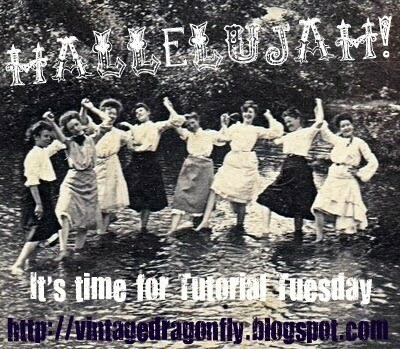 I hope you're all enthusiastic about sharing your talents and being a part of Tutorial Tuesday. I look forward to being your host! Please help spread the word by displaying the Tutotial Tuesday button on your blog. It can be found at the top of the sidebar. I've received questions in the past on how to link buttons that aren't html coded. So here's the first mini-tutorial! These instructions are for blogger. 1. Right click on the button and save to your computer. 2. In the design section of your blog, click on "add a gadget". 3. A window will open with options; scroll to and click on "picture". 4. A "Configure image" window will open. Click on "browse images" from your computer and upload the saved image (button). 5. In this same window there is a field for linking. In that field you can either copy and paste the name of the blog you are linking the image to, or type it in manually. In this instance it would be http://vintagedragonfly.blogspot.com. 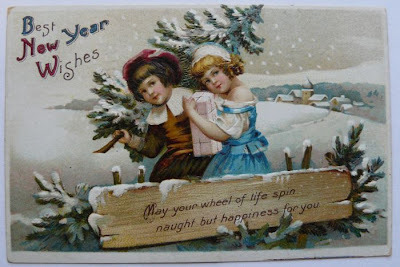 Happy 2011 My Dear Friends! Merry Christmas and every happiness in the New Year. couldn't be more perfect! 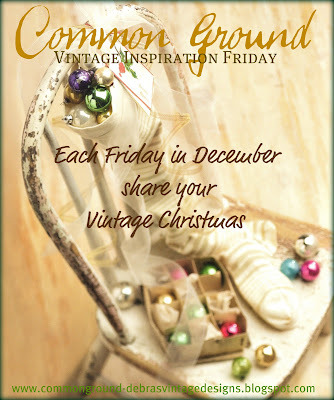 It's vintage charm...and that Santa Key stole my heart. had this precious hand knit mitten inside! Many thanks to Amy, Angela and Becky for wrapping up this countdown so beautifully. Linda had 75 of us, each making 25 matchboxes and gifts, and had them packaged and swapped out to all, with time to spare before our December 1 countdown began. Santa has some more sweet treats for me! asked the jolly old elf to leave this lace trimmed, sugared, tinseled parcel on day 22. All wonderful gifts! Thank you Becky, Genie, Amanda and Santa! All Things Heart and Home. Let's play catch-up on the last few days of matchboxes. created this charming vintage box and bottlecap magnet. Thank you all for these wonderful additions to the countdown! 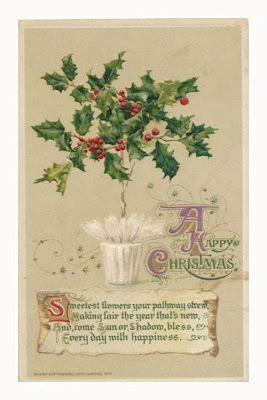 And as promised, a bit of Christmas cheer... Enjoy! It is the little things that make you feel warm and happy. It's time to catch you up on some other little things that are helping to make the season bright-Countdown to Christmas matchboxes! Day 14 from Jill, of File Under Misc. Many thanks to Carol, Jill and Kim for my new lovely little things! About 8 months ago when I tentatively approached this blogging journey, I didn't really get it. I mean, I knew about the sharing of ideas and inspiration from like-minded individuals, and I figured everyone throws in a touch of self promotion. But friendships?, camaraderie? Really didn't see that happening. Maybe there was a bit of The doubting Grinch in me. 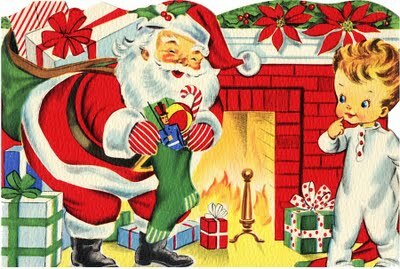 Well today I'm ready to join hands with all of you and sing a chorus of "Welcome Christmas"! Olde Baggs 'N Stuft Shirts. 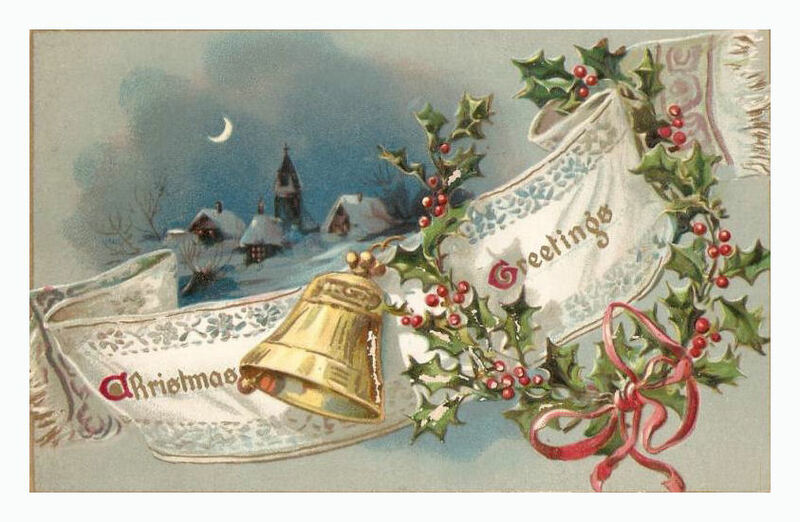 The other day I received this lovely card from Linda wishing me happy holidays. Saturday I received a package in the mail, a very pretty package. It was from sweet Wendy, of Bliss Angels. Inside was this unmistakably whimsical Wendy creation. It already found it's way to my tree! In today's mail was a package from Kim, of Tabby's Place. Kim and I have been swapping art for a few years now in various groups and she has always been supportive of my artistic and blogging endeavors. I was fortunate to be chosen as one of the winners in her Happy Holiday Giveaway. The prizes were surprises. I'd say a GRAND surprise! This was so very generous Kim. Thank you so much! So as this blogging journey continues, I find myself extremely grateful. I am blessed to have each of you in my life. Your warm spirits and kind souls make me a better person. To each of these wonderful ladies, and to every single person who passes through and leaves a kind word or thoughtful comment, thank you. Thank you from the bottom of my heart. I have this vintage-style silver tray I purchased at Michael's a few years ago that has evolved into my seasonal living room table top vignette. I didn't buy it with that in mind. It was one of those 'oooh that's pretty, don't know what I'll do with it, but I'll find someplace to put it" purchases. How funny that it's now a focal point! 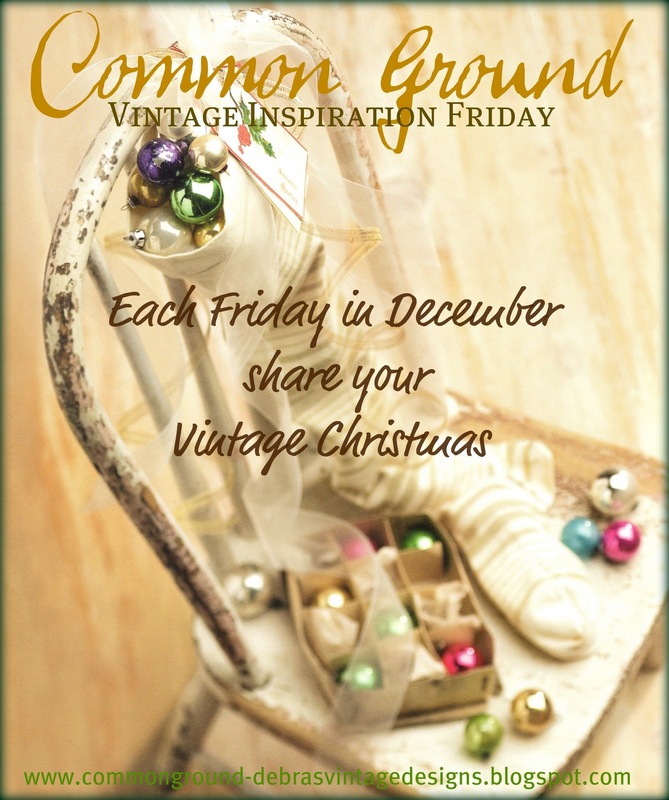 The candelabra is an antique store find that I dress up with a touch of greenery this time of year. The silver teapot is from a church rummage sale. I perched a gold glittery bird on top. A couple of silvery garlands are strewn throughout. An old textile spool with glittered lace, pheasant salt and pepper shakers (estate sale find) and other assorted bits and pieces are thrown in. The Christmas topiaries are from my days (actually 11 years!) of selling Christmas Around The World. Anyone remember them? I'm linked with Silver Sunday at Gypsy Fish where you'll find links to all sorts of wonderful Silver Sunday bloggers. I love the retro look and pink/green color combo. And the sugared earrings are adorable! made this cute Santa box and snowflake bobbypin. Thank you Tracy and Kelly! I discovered a new blog, and magazine Creating Vintage Charm. The cover was enough to sell me but the testimonials from those who have already received an issue (this current issue is only #2) should have you clicking the "purchase now" button too. AND it's on sale through the end of the month. AND you can enter a giveaway to win 2 issues! 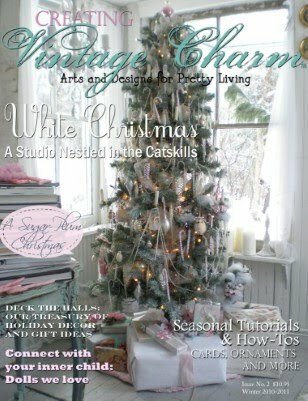 That find inspired me to share a little of my own vintage-style Christmas decor. 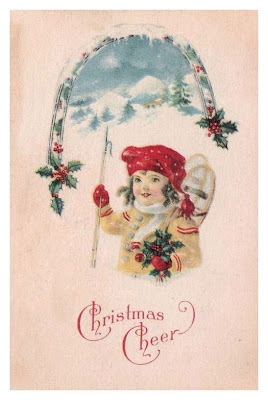 On to my Countdown to Christmas Matchboxes. Perfect timing for a snowman as we have a big storm heading our way this weekend! Some nice traditional red and green bling! Thank you both for the Christmas cheer! Or scroll down through December's posts - lots more Christmas here! I've been collecting these village pieces for many years, and of all the holiday decorating I do, amassing the village (I believe it may have grown to city status) is indeed a labor of love. Just bringing the boxes up from the basement is a job! It's extremely difficult to capture the charm and serenity of this snowy vintage winter wonderland. I hope you enjoy visiting nonetheless. All Things Heart & Home. 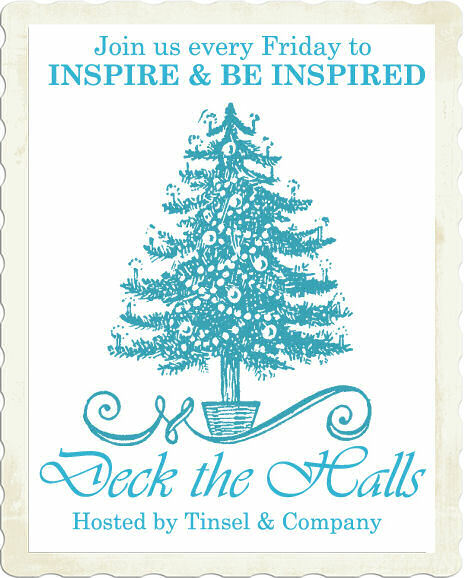 Day 2 & Some Fun, Free, Festive Links for You!